Basketball is a game of scoring and what better way to score than when the opposition’s goal isn't fully protected? 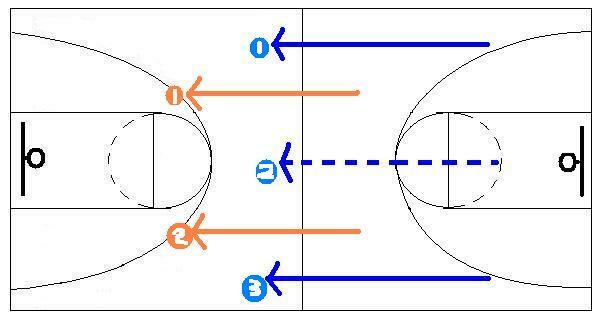 A fast break is when the offenses pushes the ball down court as quickly as possible off of a missed basket or steal to gain a numbers advantage on the defense. Of course, when the opposition is outnumbered, there’s going to be a very good opportunity to score. The break starts off with an outlet pass, which is a pass from the rebounder to a teammate to ignite the fast break. Typically, the pass goes to a player with good dribbling and passing abilities. As soon as that rebound or steal is secured, it becomes a race of how fast one team can turn to offense and the other turn to defense. A 3 on 2 fast break is when there are three offensive players pushing the ball down court to score while two defensive players get back to stop them. The blue arrows are the three offensive players on the break and the orange arrows are the two defenders. The key here is for the player in the middle to pass the ball off to one of the players on the wings and to get one of the defenders to commit. As soon as a defender commits, the player passes the ball off to the open player, thus taking advantage of their numbers. Essentially, the goal is to make the 3 on 2 into a 2 on 1. 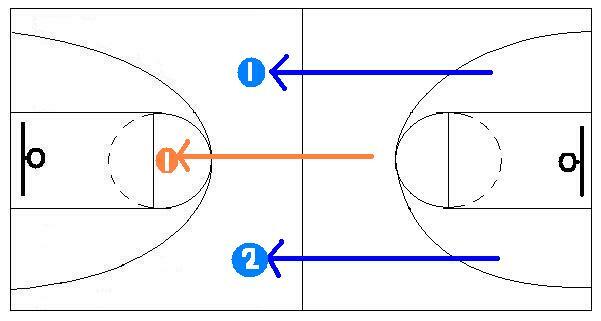 The 2 on 1 fast break is when there are two offensive players going down court going against 1 lone defender. The blue arrows are the two offensive players on the break and the orange arrow is the lone defender. The 2 on 1 is a simpler version of the 3 on 2. Here an offensive player starts with the ball and passes to his teammate. Again, the key is to get that defender to commit. For the offensive player that has the ball at about the 3 point line, take it all the way unless the defender steps in and commits. Once the defender commits, pass it to your teammate for the score.